In this reprint of New York Times bestselling author Laura Childs's latest Tea Shop Mystery, Theodosia Browning attends a "Rat Tea," where the mice will play...at murder. When Indigo Tea Shop owner Theodosia Browning is invited by Doreen Briggs, one of Charleston's most prominent hostesses, to a "Rat Tea," she is understandably intrigued. As servers dressed in rodent costumes and wearing white gloves offer elegant finger sandwiches and fine teas, Theo learns these parties date back to early twentieth-century Charleston to promote better public health. 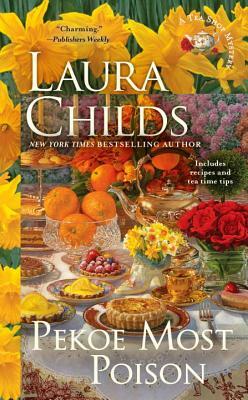 Laura Childs is the New York Times bestselling author of the Tea Shop Mysteries, Scrapbooking Mysteries, and Cackleberry Club Mysteries. In her previous life she was CEO of her own marketing firm, authored several screenplays, and produced a reality TV show.